For a truly indulgent breakfast, you can’t go wrong with this classic. Drizzled with the rich Knorr Hollandaise Sauce, these flawless poached eggs are served on buttery brioche and delicious grilled salmon. Bake the bread in clarified butter until it’s golden. Slice the salmon into 10 portions. Clean and boil the asparagus. Poach the eggs in water with vinegar. Heat the hollandaise sauce and put in a siphon. Place the toast in the center of the plate. Season the asparagus and the spinach and put them on the toast. Put the grilled salmon on the asparagus. Add the warm poached egg. 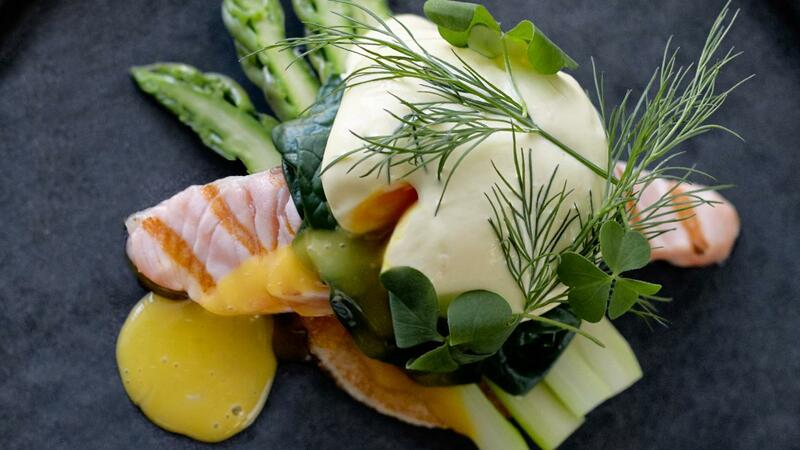 Finish with Knorr Hollandaise Sauce from the siphon. Garnish with dill and wood sorrel. Cut the egg so the yolk runs out.